When it comes to effects which operate purely based on gain, distortions and overdrives are still the top choice of many guitar players out there. However, there is one branch of effects that precedes most of the stuff we are used to hooking up to our signal chain today. Where To Put The Fuzz In Your Signal Chain? Not a lot of people know this, but fuzz is actually a direct predecessor of distortion pedals and is quite a bit different. Compared to any of the already popular models from this list, fuzz pedals are a bit less predictable. This wacky effect was first created in the mid-’60s and has since been used with varying degrees of popularity. The truth is that fuzz effect offers a refreshing change compared to standard distortions and overdrives. The quintessential fuzz pedal that offers exactly what fuzz effect should be. ZVex created a very unique boutique fuzz that delivers a different experience. Hoof is one of those small time pedals that made it big. An older design that has remained in the top 10 for decades. Made popular by Hendrix, this is a very iconic but basic fuzz. A niche fuzz pedal that has all the potential necessary for greatness. Standard Catalibread high quality design that performs just as you would expect. Impressive pedal with an abundance of range and even more tone control. This is a fuzz box with a pretty unique character compared to the competition. Equipped with simple controls. this pedal packs a hefty punch with style. If there is one model of fuzz pedals that fully represents the whole category of these pedals, it’s the Electro-Harmonix Big Muff Pi. This thing has been around for several decades. The pedal’s incredible performance was tried and tested numerous times by now. What helped the Big Muff Pi gain such a large following was its ability to pump the signal chain full of noise. However, it wasn’t just any kind of noise, it was something you could mold and work with. The pedal itself came in what is by today’s standards an unorthodox format. The item’s build quality was put through its paces on many stages around the world, and it never failed to deliver. Compared to some modern fuzz pedals, Electro-Harmonix Big Muff Pi is a bit conservative. However, that is what makes it so beautiful in the first place. If you are new to fuzz pedals and you want a low-risk model as your first one, this is without a doubt, the one to go for. Remember how we mentioned that there is a huge divide between the germanium based fuzz boxes and silicone based ones? Well, we’re about to show you one model that makes the germanium purists all warm on the inside. 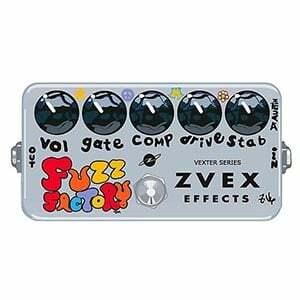 ZVex Fuzz Factory is a somewhat modern take on the fuzz design. This particular pedal comes with a bit more controls available, so the range of tones you can dial in is pretty impressive. The main reason why it’s so popular comes from its two germanium transistors. Germanium, in general, provides a fairly warm fuzz effect that is smooth around the edges. So having two transistors tells you right away that the tone from this thing is going to be something special. Small form factor, build quality that takes whatever you can dish out, and the sound which will force a smile on your face are just some of the reasons why every guitar player should have one of these pedals. After showing you two legendary models, we have another one for you to check out. EarthQuaker Devices Hoof is by far one of the best Muff Pi clones ever made. Since Electro-Harmonix formula was proven to be the way to go, a lot of manufacturers took their basic design and tried to add their own twist to it. Needless to say, only a select few actually managed to create something worth talking about. What EarthQuaker did with their Hoof fuzz is beyond that. This pedal is not just a great Muff Pi clone, but it has ascended to a completely different level. EarthQuaker Devices managed to design a fuzz stompbox that had all the qualities we love about Muff Pi, plus additional range, and more gain. This lethal combination is the reason why this particular model is often times quoted to be the best fuzz pedal out there. However, that comes down to personal taste. 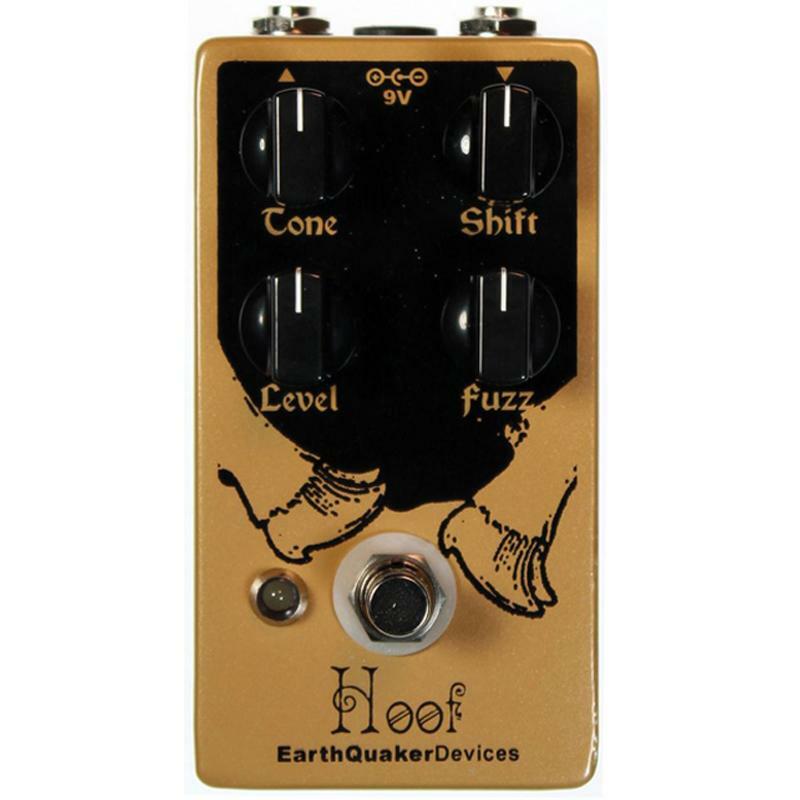 What we need to mention is that EarthQuaker Devices Hoof is different from a lot of fuzz boxes, and it offers a great evolution to the already proven platform. You can’t go wrong with this one. Fender is not a name that you would usually associate with madness and risky builds. However, their Fender Blender fuzz box is a testament that this giant has a wild side. Before we go any further, we need to mention that this is no ordinary fuzz pedal. Fender Blender actually acts as an octave effect as well. In all essence, as long as you don’t touch the Tone Boost feature, you will be able to enjoy one of the more unique fuzz tones in the available spectrum. With that said, everyone who ever used this beast had to start playing with the Tone Boost, so let’s talk about what happens when you engage this feature. If you can imagine what it’s like to wrangle a wild Mustang while blindfolded, that should give you a pretty decent idea of what happens when you press this switch. All of a sudden the signal is infused with a whole bunch of gain that is very hard to control. Dialing in a decent tone on the go is borderline impossible. However, once you do manage to find a good setting, this fuzz pedal puts on a very sweet face that is worth all the effort. One more old school legend that needs to be mentioned is the Dunlop JDF2 Fuzz Face. This is both one of the oldest fuzz boxes ever made, and one of the best. Jimi Hendrix made it popular for the most part, and afterward, things just began to develop in the right direction. Dunlop JDF2 Fuzz Face comes in a very unique enclosure, which is why it’s called Fuzz Face. This landmine looking stompbox is still being made in a more or less original form, and using it offers a trip back in time. The pedal’s performance is vintage by today’s standards, partially due to a pretty tame tone. However, if you really wanted to, you can dial in a variety of gain infused guitar tones that will leave you wanting for more. Sure, there are more challenging and better fuzz pedals on the market, but this Dunlop represents a piece of music history that is worth the price tag you are asked to pay for it. If you are trying to get that Jimmy Page or Hendrix tone on your guitar, you will hardly find a better tool for the job than the Dunlop JDF2 Fuzz Face. We have covered some of the classics, but now it’s time to walk into the new age. 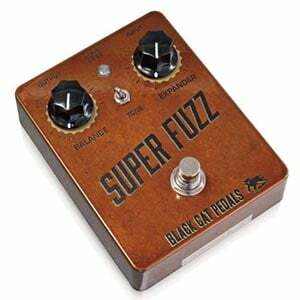 When it comes to modern fuzz boxes that do a great job at replicating some vintage circuits, Black Cat Super Fuzz stands out for a number of reasons. Primarily, this thing has an awesome tone. It offers a bit of that ’70s vibe, but with a reasonable amount of additional gain at your disposal. On top of that, you also get an octave doubling circuit. Talk about a whole new layer of versatility. Those who are trying to dial in artist specific guitar sound might want to skip this fuzz, but those who are not afraid to experiment with modern tone will love the Black Cat Super Fuzz and all of its extra gain. The pedal comes in a familiar Muff Pi type enclosure that is very minimalist in terms of the color theme used. In all honesty, this is one heck of a fuzz pedal that deserves a lot more exposure than it gets at the moment. Boutique fuzz pedals are the saviors of this segment. Those more conservative models will get you only so far. If there is one brand that we are happy to see in this segment of the market, it’s Catalinbread. These guys simply know how to make an effects pedals and cover all of their bases. Seeing them pushing out a fuzz stompbox was one of the more exciting moments in the industry, that’s for sure. Catalinbread Karma Suture Harmonic Fuzz is a different type of beast. They based their circuitry on a fairly obscure design that hasn’t been seen in long while. The benefits of this approach are best seen in Karma Suture’s ability to dwell into jazz territory without being out of place. This thing simply has boatloads of range and headroom. With evenly matched harmonics, you get a well-rounded fuzz pedal that sounds like nothing out there on the market. This isn’t to say that different is always better, but in this case it most definitely is. Another great boutique design comes straight from Way Huge. This company with a unique sense of humor has been delivering some of the most interesting guitar effects pedals in recent years. 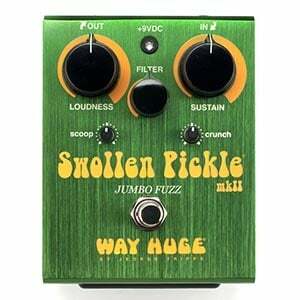 Swollen Pickle fuzz box we are looking at today definitely belongs to this group. The core of this circuit lies within the savage amounts of gain that you can tap into whenever you want. However, Way Huge didn’t stop there. Making another hot-rodded fuzz factory was too boring. They had to go a step further. Adding the powerful filter whose range is beyond reason and logic really gives this pedal the extra punch. Insert a side dish of tone stack scoop control, and you got yourself a real sonic hand grenade that can be your best friend, or your worst enemy, depending on how careless you are with dialing in your tone. If go about this with some caution, the tone you can get in the end will be mind-blowing, to say the least. That’s Way Huge for you. Among today’s effects pedal builders, Wampler is one of those that likes to think outside of the box. Taking someone else’s design while adding a few bells and whistles is simply not their style. So when they set out to build a fuzz box, it’s bound to be different in at least some way. Wampler Velvet Fuzz V2 is a pretty unique fuzz pedal that brings a lot of versatility to the table. Unlike a lot of modern fuzz boxes, this one actually has some tangible substance. It packs a mean punch, but it also allows you to shape that gain into a usable format that will work with a variety of applications. Transparency of this pedal is impressive. You can actually hear the untouched signal pushing through the fuzz layers, which gives it a pretty rare color. However, having that raw signal in there allows you to bring fuzz into places where you otherwise simply couldn’t. In simple terms, this is not your regular fuzz box, and it can’t be compared to standard Muff Pi clones. Is it worth getting? Absolutely. Lastly, we have a fuzz pedal that is raw, savage, and it’s proud of that. Death by Audio Fuzz War V2 takes a very pragmatic approach to delivering gritty fuzz awesomeness. There is nothing refined here, and no training wheels to help you out. Audio Fuzz War V2 packs tons of gain that are held back by a set of rather simple controls. Once you plug your guitar into this thing, you will feel like paper thin walls are holding the gain from flooding out and over saturating the signal chain completely. It’s fair to say that it takes a while to dial in a tone that isn’t too aggressive nor too tamed. This wild and raw nature are one of the reasons why we just had to include this beast on the list. Compared to any of the popular overdrive pedals from this list, Death by Audio Fuzz War V2 comes across as a much more capable beast to wrangle with. For a new guitar player, the whole classification of overdrives, distortions and fuzzes can be extremely confusing. To an untrained ear, all of these tend to sound more or less the same. Strangely enough, the confusion is extended to seasoned players as well. This is why you will sometimes see distortions labeled as overdrives, vice versa and fuzzes labeled as distortions. A fuzz box is very different than a distortion pedal even though they loosely belong to a same group of effects. A regular distortion pedal takes the signal, clips it carefully and pushes it out the output lane. What you get on your end is a distorted sound that sounds the same at every volume. In comparison to that, a fuzz pedal takes the signal and clips it extremely hard. So much so that you get a square signal. On top of that, fuzz pedals use transistors to add gain. What this does is infuse enormous amounts of gain, but also infuse the signal with plenty of noise. If overdrives were orderly pedals and distortions were somewhat unhinged, then fuzz boxes are pure savagery. A fuzz pedal does what ever it wants to do, simple as that. With that said, something very interesting happens when you use a fuzz pedal. While it does scramble the signal hard, a fuzz pedal tends to preserve the core of said signal. The result is a tone where you can recognize an overdrive cone that is surrounded with a bunch of fuzzy, wooly overtones. Add a chorus pedal to the mix and it can definitely surprise you. When it comes to fuzz boxes, there are two opposing faction, each one heavily invested in one ofthe two types of transistors. As always, it is best to view the available options and see what best suits your needs. Before we dive into this categorization, it is worth saying that both types of pedals are great.. The first type of pedals uses germanium transistors, which are what was originally used in fuzz pedals. The benefit of using germanium transistors is their unique tone signature. Germanium fuzzes are warmer in nature, smooth and fairly organic. The issue with using germanium is that it isn’t as available as silicon. This makes the pedals more expensive by default. Purists will insist that germanium is the only way to go with fuzz pedals and that nothing else comes even close. That is a discussion we won’t get into. In our opinion, both germanium and silicon pedals have their applications. Speaking of silicon fuzz pedals, lets find out what makes them different. These became popular when pedal manufacturers figured out it was much cheaper to use silicon instead of germanium.Aside from the obvious production cost reduction, there were some additional side effects. Most notable being the change in the way the pedal sounds. With silicon transistors, you are getting a much more aggressive fuzz sound that isn’t as warm, and is rather raw. To an untrained ear, both germanium and silicon fuzzes will sound more or less the same. However, those who are after that authentic Hendrix tone will undoubtedly go with germanium. As we have said before, it comes down to personal taste. One thing you will learn about the fuzz effect is that it was mostly used back in the day of Hendrix, The Rolling Stone and similar bands. Because of that, many still see these pedals as a gateway to vintage rock tone. However, more and more modern bands are using fuzzes over the other two alternatives. Needless to say, fuzz effect still has its place on a pedalboard. On top of that, another cool thing about fuzz pedals is that their tone changes as you start increasing or decreasing volume on your guitar. As we have said before, fuzz is very dependent on the strength of the signal that is being fed into the pedal itself. In other words, if you keep your guitar’s volume low, you will get a fairly clean sound with very little distortion going on. As you roll off the volume, more and more fuzz will kick in. From a purely practical point of view, this means that you can find a setting on the pedal that allows for several awesome tone profiles which you can access using the volume knob. With all of this being said, you need to be careful of how that change in input volume affects your other pedals. Last little tip we would like to share is the pick response. Fuzz pedals are one of the rare effects that actually respond differently depending on how aggressively you pick your strings. Harder picks yield more fuzz while weaker picks tend to keep the tone fairly clean. In a way, you can use a fuzz pedal to see exactly how much your picking technique varies as you play. Fuzz pedals, much like distortions and overdrives, are generally placed at the very beginning of the signal chain. With the other two, you have some leeway in this sense, but with fuzzes you have to be pretty careful. The reason for this is the fact that a fuzz pedal works best with a raw signal straight from the guitar. The moment you put something in front of it, the pedal could start acting up. As a matter of fact, most fuzz related issues can be solved by simply moving the pedal closer to the guitar if it isn’t already the first thing in the chain. Fuzz pedals are still here after so many decades of continuous use. They represent a window back in time when signal chains were much simpler, and guitar tones a lot less predictable. Not only do we have the opportunity to play the exact same models some of the most legendary guitar players known to man used in their personal rigs, but we also have a wide range of modern renditions that are every bit as good. Getting used to fuzz takes some time, and you will definitely need to employ some finesse to your tone configuration, but the end result is simply too satisfying to ignore. Plugging into a good fuzz pedal will show you why going back to the roots is not always a bad thing. We hope you had a good time joining us for this little rundown, you can rest assured that each of the selected items is simply choice you cannot regret making. Now it’s only a matter of jotting down your personal needs and finding your perfect match. Rock on! Thanks for the informative list. I have Dunlop JDF2 Fuzz Face and it is strikingly similar to what you have described. So far my experience with Dunlop JDF2 Fuzz Face has been pretty fantastic.